We understand that savings account rates are typically low. This is the reason we are now offering an account that offers a great rate combined with total liquidity. We understand that many members are reluctant to tie up all of their funds in fixed-term CDs and would prefer to keep part of their money in easy-to-access cash. 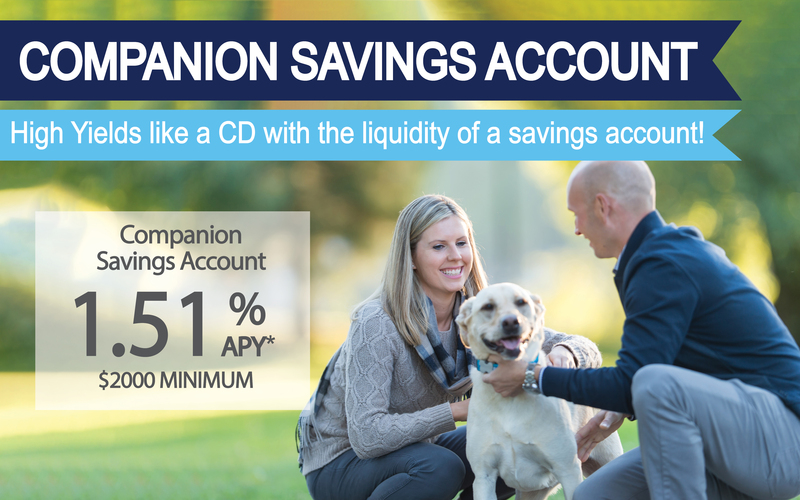 Introducing the Companion Savings Account- An account to accompany newly issued CDs that provides savers the best in savings – HIGH YIELDS LIKE A CD without TIME LIMITS! The Companion Savings Account provides just these benefits. You are able to have the best of both worlds with some funds locked into a great paying CD and some funds available in a high paying liquid deposit account. New First Bank Kansas CD account holders are eligible for our premium priced Companion Savings Account of equal or lesser size to your new CD. This high-yield savings approach appeals to all members because of its well-priced long-term nature. This special deposit account does not allow additional deposits. 1.51% APY* – First Bank Kansas not only offers outstanding CD rates, but is now offering a 1.51% APY deposit account which can be opened in companion with your new CD.